Jenna Prandini, BA '16, earned All-America honors on the track and in the classroom, but now faces the biggest test of her life. Update: Jenna Prandini finished third in the women's 200-meter finals at the US Olympic Trials to qualify for the Olympic Games in Rio starting August 5. In addition, Prandini was selected as one of the six runners available to compete in the women's 4x100-meter for the United States. In the time it takes Jenna Prandini to run 100 meters, the average person could… well, they couldn’t do much at all. After all, what can a person really get done in fewer than eleven seconds? They couldn’t boil an egg. They couldn’t fast-forward through a commercial break. What they could do, though, is spend as much time thinking about the 2016 Summer Olympic Games as Prandini, one of the fastest women on the planet, has. When Jenna Prandini won the 100-meter title at the Mt. Sac Relays in April, her time of 10.95 seconds was, at that point, the fastest in the world in 2016. Only 23 Americans throughout history have run faster than Prandini’s personal best of 10.92, a list that includes names as legendary as Evelyn Ashford, as tainted as Marion Jones, and as divisive as Florence Griffith-Joyner. Just 20 have run faster than her 200-meter personal best of 22.20 seconds. July 2. July 3. July 8. July 9. July 10. Those are the dates of the 100-meter and 200-meter first rounds, semifinals, and finals at the US Olympic Team Trials at Hayward Field, and as far as Prandini is concerned, they’re the only dates that matter right now. That kind of focus and determination is what propelled Prandini through a collegiate career that saw her named an Academic All-American for her work in the classroom while also earning fifteen All-America honors for her work on the oval. 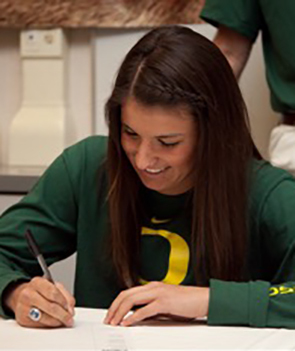 Prandini enrolled at the University of Oregon after a standout career at Clovis High School in Clovis, California, where she won the USATF Junior national championship in the long jump, claimed state titles in the 100, 200, and long jump, and competed at the Pan Am Junior Championships during her senior year. 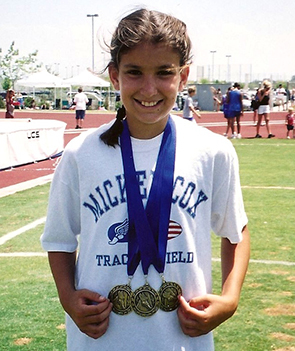 A young Prandini with a collection of medals, signing her National Letter of Intent to attend Oregon, and crushing the competition in high school. At the UO she redshirted her first year, before winning two Pac-12 titles and earning four All-America honors her second. The following year she claimed the first of her three individual NCAA titles, winning the long jump, and earned four more All-America places. Then came 2015, a year in which she emerged as one of the most dominant figures in track and field. UO outdoor records in the 100-meters and 200-meters. The fastest indoor 200-meter time and farthest indoor long jump in school history. NCAA outdoor titles in the 100-meters and indoor long jump. Seven All-America finishes. 26 individual points scored as the Ducks won their first outdoor title in 30 years (a haul that would’ve seen her finish eleventh in the team standings if she ran unattached instead of with the Ducks). The USA national 200-meter title. 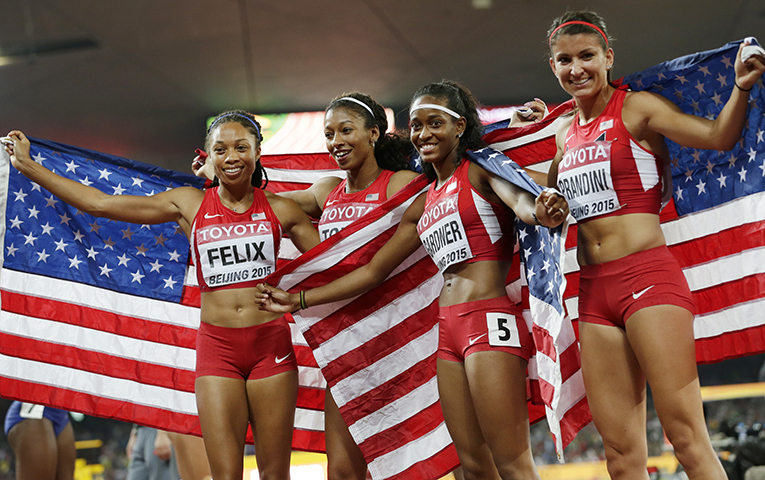 A silver medal in the 4x100 at the IAAF World Championships. With those performances came accolades—and plenty of them. The University of Oregon Athlete of the Year award. The Track and Field News Outdoor Track Athlete of the Year award. The Honda Collegiate Track Athlete of the Year award. The Bowerman Award as the nation’s best collegiate track and field athlete. And she did it all while juggling her athletic pursuits with her work in the classroom. 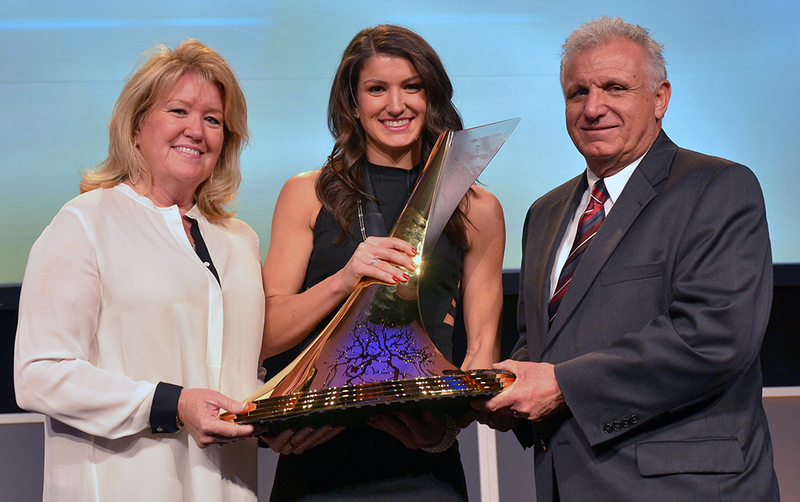 Prandini won the Bowerman Award, collegiate track and field’s most prestigious individual honor, in 2015. She is pictured with her parents, Carlo and Theresa Prandini. 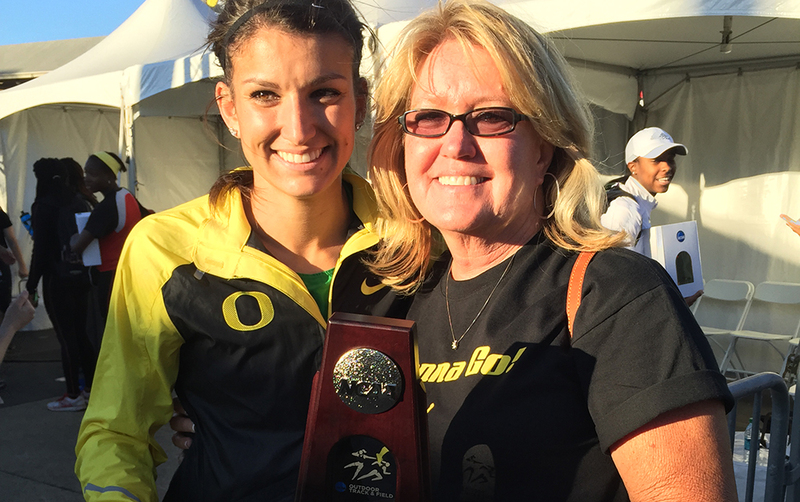 Prandini and her mom, Theresa, with her runner-up trophy for finishing second in the long jump at the 2015 NCAA Outdoor Track and Field Championships. Prandini was undeclared her first two years at the UO, but after taking a number of business classes found she had a passion for the subject. She declared her major in general social science with concentrations in business and economics, and then set about juggling her coursework with the demands that come with being an elite student-athlete. During the track and field season, her schedule consisted of lifting weights at 6:00 a.m., then spending several hours in class, going to Hayward Field for practice at 2:00 p.m., then heading to class again or tutoring. When that was over, it was back home to study and do homework before repeating the process the next day. Lift weights. BA 316 Management: Creating Value through People. Work on reaction time from the blocks. BA 318 Finance: Creating Value through Capital. Correct form, relaxed shoulders, elbows back, mid-foot strike, rapid turnover. Term papers. Tutoring. And so on, all throughout the season. “After a year or so it became natural and was just something that I did,” she said. And when Prandini says she figured out how to balance schoolwork with sprinting, she isn’t exaggerating. Her stellar 2015 season that saw her earn seven All-America honors, win the Bowerman Award, and compete at the IAAF World Championships was also the year that saw her earn Academic All-America and her third-straight Pac-12 All-Academic honors. 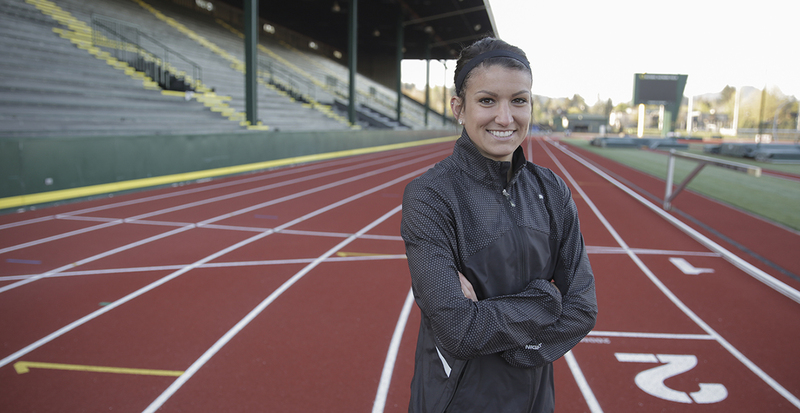 With a 3.55 GPA, Prandini became the UO’s twenty-seventh women’s track and field Academic All-American, and continued an eight-year unbroken streak of Ducks earning the honor. Prandini finished her class requirements during the UO’s winter 2016 term, and opted to sign with Puma and turn professional in the Olympic year instead of returning for one final season with the Ducks. She remained in Eugene to train under UO assistant coach—and 2016 US Track and Field and Cross Country Coaches Association Women’s Assistant Coach of the Year—Curtis Taylor, and the pair carefully selected the meets she ran as a new professional preparing for the Olympic trials. Those meets included the 100-meter win at the Mt. Sac Relays; the 100/200 double at the Cayman Invitational, where Usain Bolt made his 2016 debut; and a fourth-place finish in the 200 at the Prefontaine Classic, which was run just two weeks before she received her diploma at the university’s commencement ceremonies. 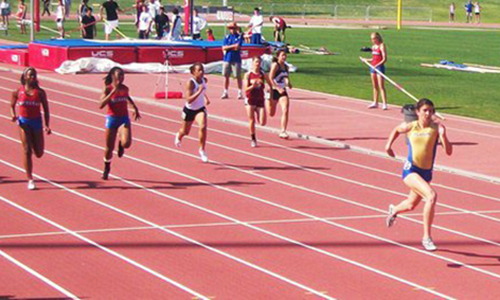 If college is supposed to prepare you for life after school, Prandini is definitely finding her business and economics knowledge helpful as she navigates life as a professional track and field athlete, a world filled with sponsors, agents, and taxes. Prandini with her management professor, Neil Chinn. 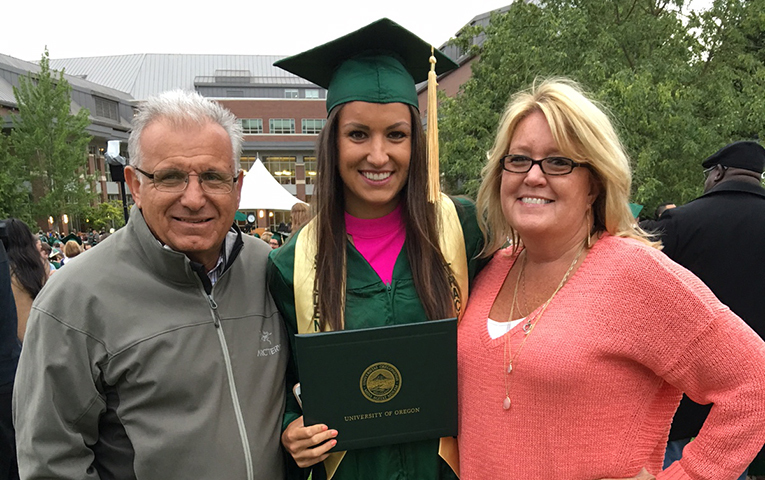 Prandini and her parents following her commencement ceremony in June. And while her business and economics classes prepared her for the fiscal side of life as a professional, the work she has done during her first season as a pro—the countless hours spent on the track under the blazing sun, sweating, aching, and urging every fiber and sinew to go faster, faster, and faster again—has prepared her for her first-ever Olympic trials. Not the Olympics—the trials, where close to 50 family members and friends will be in the Hayward Field stands, wearing matching Jenna Prandini t-shirts and cheering her on. Much like when she is tearing down the Hayward Field home stretch at 25 miles per hour, bearing down on the tape at the finish line, leaving her opponents gasping for breath behind her, she’s only focusing on one. Step. At. A. Time. “Going into races now I’m going against the fastest girls in the world,” Prandini said. “I’m not going to the NCAAs, when I know if I make a mistake or two I can still fix it in a race and come back and run well. For me it’s just about staying calm and being confident in my training and race model, and not focusing on anything besides what I’m doing in my lane. 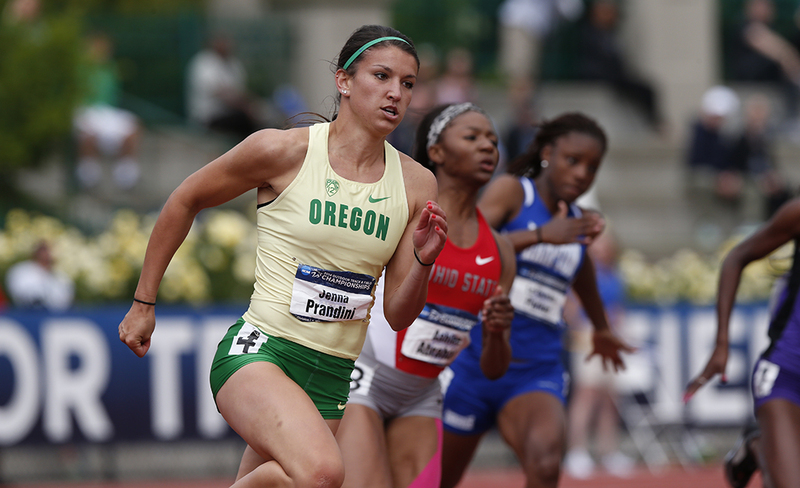 Prandini is one of approximately 40 current and former Ducks who competed at the US Olympic Team Trials at Hayward Field July 1-10. For more information on the 13 current and former University of Oregon student-athletes who qualified for the Olympic Games, read Going for Gold. 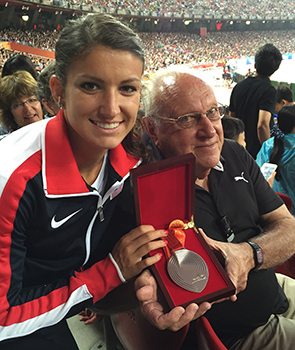 Prandini and her Nonno, Carlos Prandini Sr., hold her silver medal from the 2015 World Championships.